Currently one of the fastest accelerating cars in the world, the rare Atom 3S Turbo is light years ahead of the naturally aspirated Atom 3 in performance. Lighting fast speed is combined with the most desirable upgrades and “hand-of-God” Alcon brakes as standard equipment. In addition, the car has a Hondata traction control system for improved confidence when the pedal hits the floor. We are a factory authorized Ariel dealer. Buy with confidence! While current wait times for new factory orders are around six months, this 3S is like new, on the ground, and available for immediate delivery. 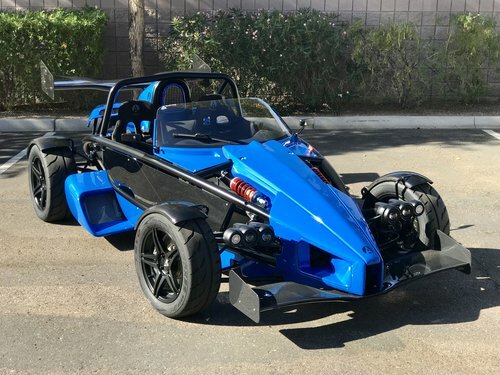 This one-off LOADED Atom 3S is custom finished in paint-to-sample Porsche Voodoo Blue, along with several carbon fiber upgrades. The car is a show-stopper in person and must be seen to fully appreciate. The car has had absolutely no track time and is in mint condition. The original owner loved it but recently had an opportunity to purchase a leftover untitled $400K Lexus LFA and he decided that the investment was worth making. Feel free to call with any questions, or if we can be of assistance with door-to-door vehicle transport service. * Please give us a call to inquire about street legality options in your home state, or check with your state MVD regarding specialty construction vehicle regulations since the Atom is not a federalized vehicle.